This post is exclusively all about beautiful leg Mehndi designs. You will find a huge variety of mehndi art styles ranging from Arabic Mehndi style to Moroccan Mehndi style. 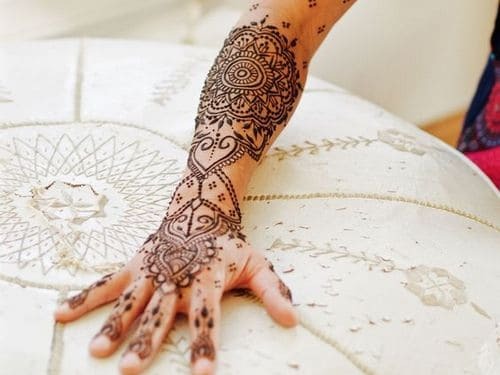 The designs also vary from elaborate henna designs for would be brides to simple henna designs for a stylish look. Have a look at these beautiful and attractive leg Mehndi designs. 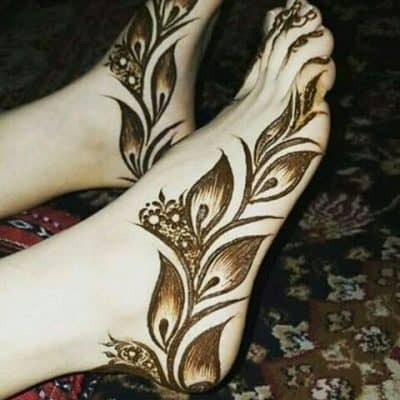 1: Beautiful Arabic Mehndi design for feet. This intricate floral vine design is for all the girls who love Arabic Mehndi design. The creative use of dots have made this design more beautiful. 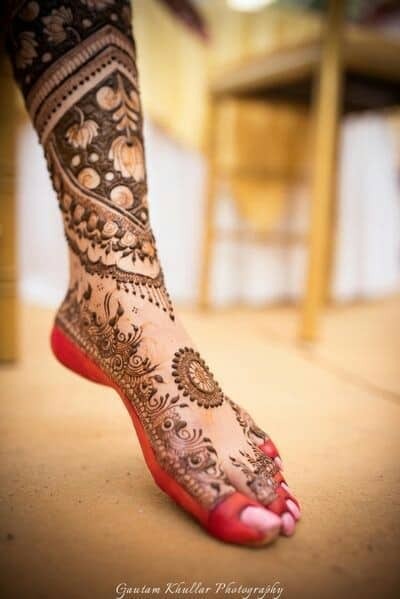 2: The Rajasthani style of Mehndi design for feet. The perfect one for the brides as the design resembles with the beautiful Indian jewelry. This beautiful mehndi design for legs will surely complement with your anklets. 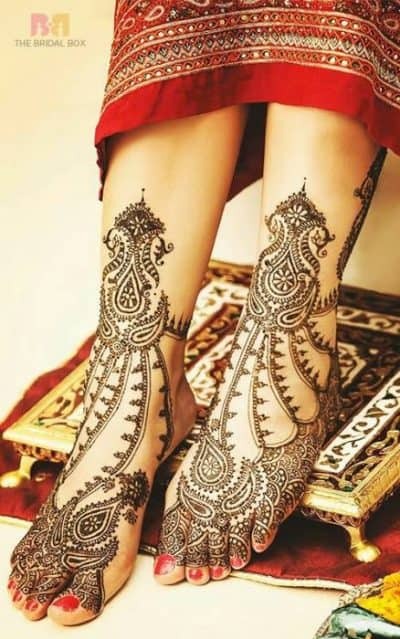 3: Beautiful long Arabic Leg Mehndi designs. Girls who are fond of henna and are looking for knee length design can pick this beautiful Arabic henna design for decorating their legs. Great thing about this design is that you can extend it to any length you only have to repeat the design. 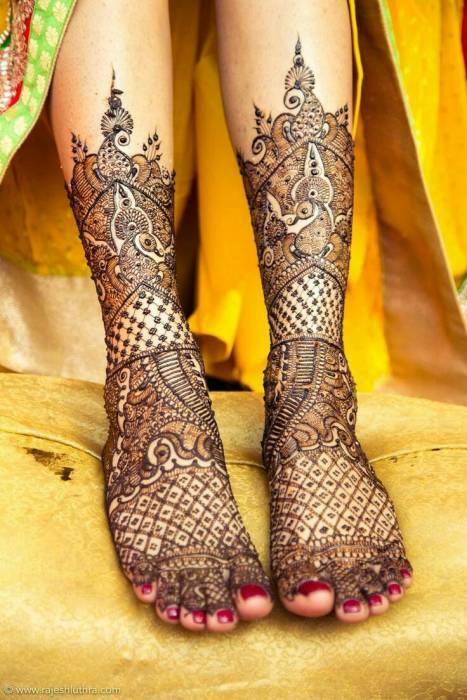 4: Beautiful Gujarati style of Mehndi design for feet. No accessories needed with this Mehndi design, it completely defines and beautifies your feet. The flowers at the centre are the main highlights of these design. 5: Another beautiful design for feet decoration. The design is brief but attractive. This design will accentuate all the curves of your feet and you are surely going to ditch your anklets for it. 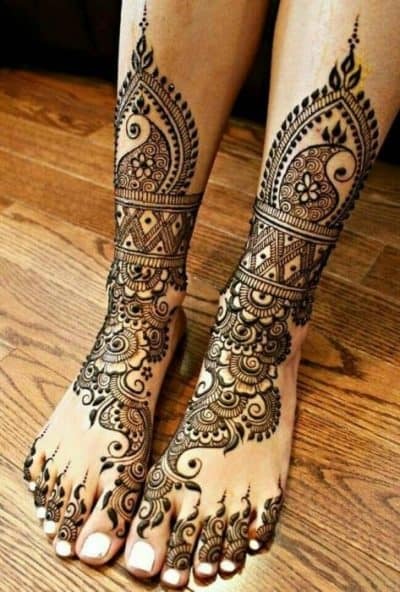 This beautiful Indian Mehndi design creatively covers the whole feet and give them an attractive look. It decorates your feet with a beautiful lace like pattern. 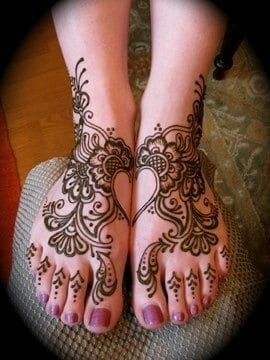 Simple Arabic Mehndi design for feet with a beautiful heart design in the center. The beautiful addition of heart on a simple arabic mehndi design is like icing on a cake. Bold Arabic Mehndi design for feet with a fine shaded design to give it a three dimensional look. If you love the bold rich color of heena then this leg mehndi design is for you. 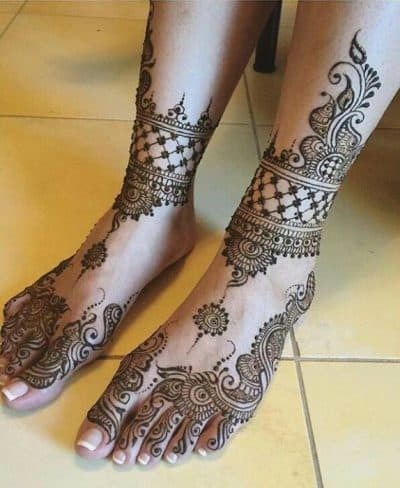 Unique Moroccan Mehndi design for feet with creative and sharp geometrical shapes. 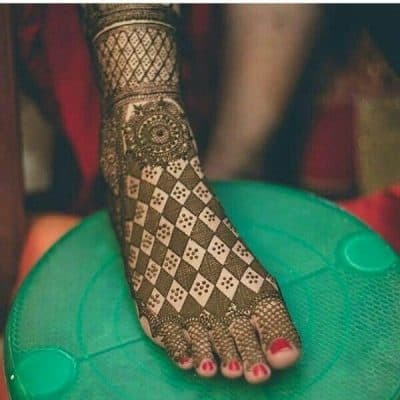 Pamper your feet with this unique tribal mehndi art. Arabic rose Mehndi design with intricate Mehndi art. If you are fond of complex Mehndi art, then this one is for you. Beautiful roses will give your feet a delicate appearance, all that your feet are looking for. Beautiful Rajasthani Mehndi design for the bride to look perfect on her wedding day. Beautiful chain like pattern across your slender legsis surely going to redefine the beauty of mehndi art. Gujarati style of Mehndi design for the girls who love traditional art. 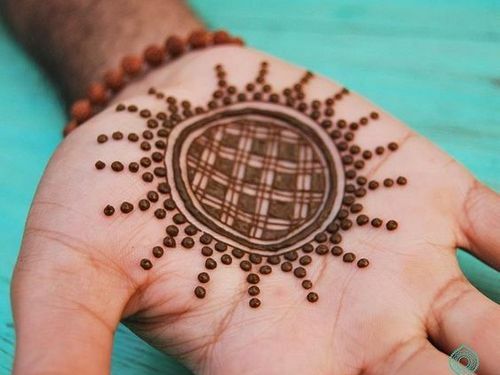 Tiny dots have added to the beauty of this mehndi design. 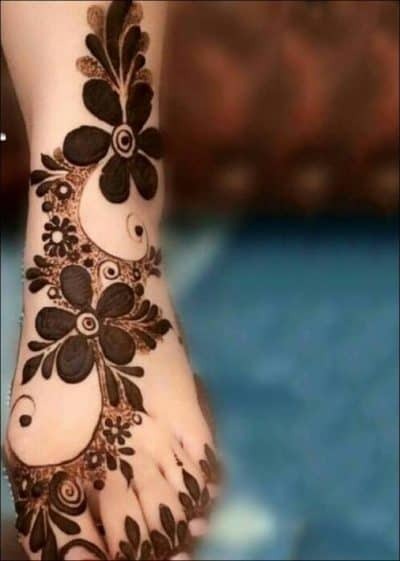 Refined Arabic Mehndi design for feet, which is brief but complex in its look. Great pic for brides who love floral designs. You can also try this unique Arabic Mehndi design which has used shading technique to give it a different look. The mighty peacock design for the legs with contemporary motifs. This design gives a quick glimpse about rich Indian traditional art. Unique reverse henna design for legs. 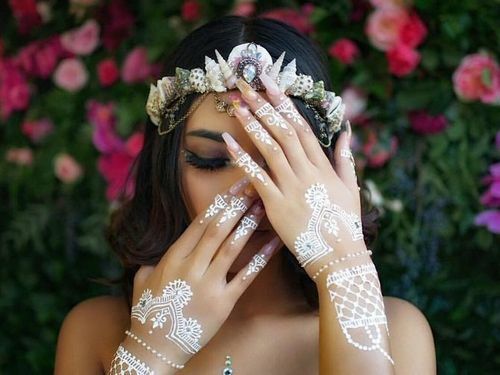 This bold and beautiful henna design is perfect for brides. The beautiful use of negative spaces to highlight the beautiful lotus motifs looks so pleasing on the feet. You can also try the beautiful blend of two arts to create a magic in your feet. Mixing Arabic with traditional Indian art is surely has got all the potential to grab everyone’s eye. 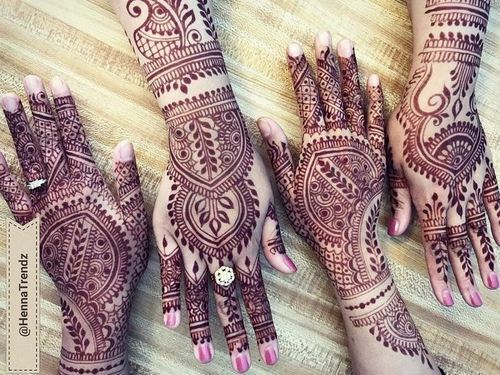 Intricate Indian traditional Mehndi design for a bride. This Leg Mehndi design might be quite hard to master but the end result is so amazing. 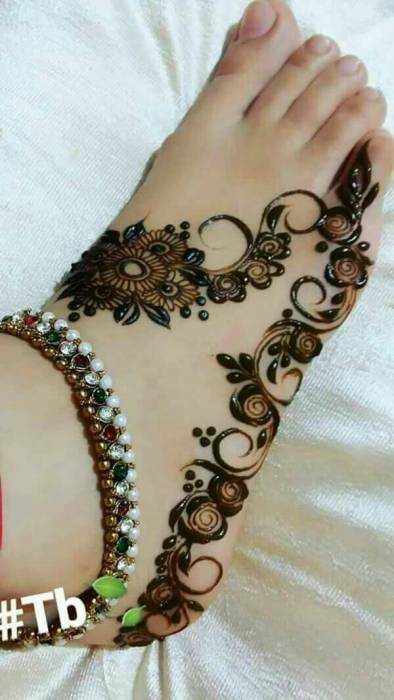 Complex chain art style of Mehndi design for feet. If you are searching for some fine leg mehndi design with a touch of traditional art then this may be your best pick. 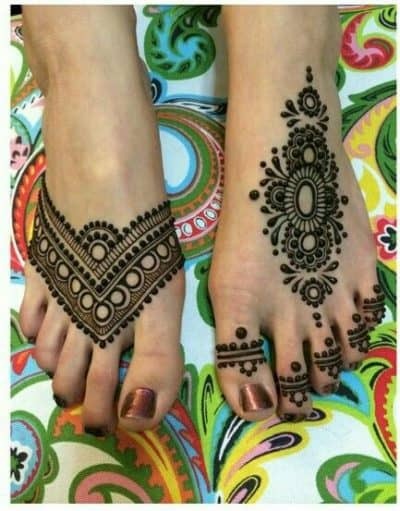 Stylish asymmetrical Mehndi design for feet. Want to try something trendy then try differnt designs for both the feet. While trying assymetrical style keep the mehndi art style similar like either go for arabic, morocaan or rajasthani but never mix the two. Here the designs are different but belong to same moroccan style of mehndi art. Intricate Mehndi design for feet with beautiful filler designs for filling the gaps. 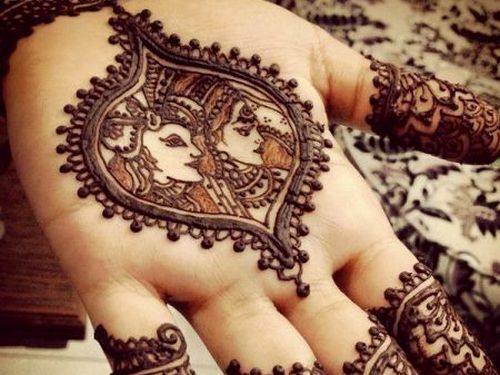 Great mehndi design for brides as the design needs to be as heavy as the bridal outfits. 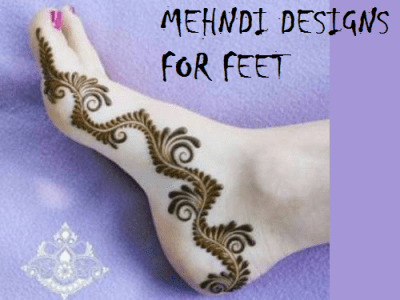 Traditional bridal Mehndi design for feet. This beautiful Mehndi design is enough to generate the attention of others. The beauty of this design lies in the hand of the mehndi artist i.e how symmetrically he can apply this design. 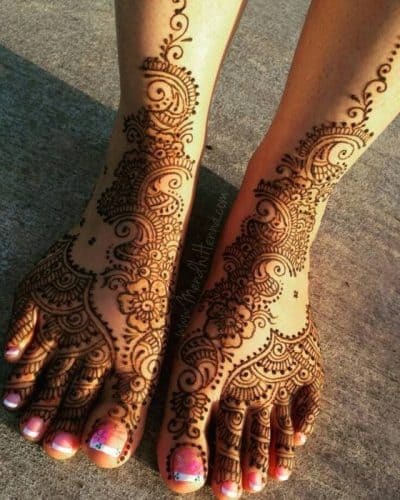 Beautiful lace pattern Mehndi design for feet. 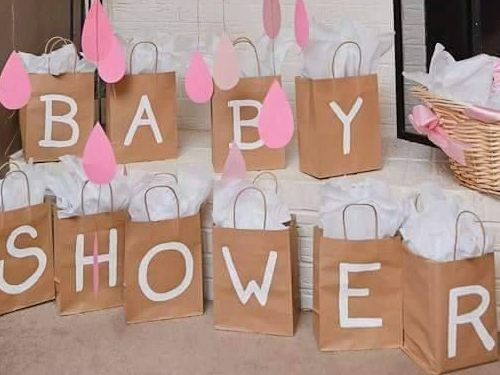 This design is quite easy to make and will look good at small family functions. 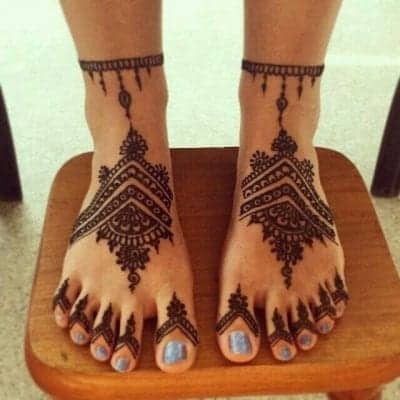 Simple and cute ornamental Mehndi design for feet. This cute mehndi style will also look good on the feet of little girls. Beautiful border in Arabic Mehndi style for legs with a cross arabic floral vine design to give the feet a fuller look. A good Nail art design will make these Foot Mehndi designs look more beautiful and appealing. Try the below given Nail art designs to add more glitter on your feet. Also, help us to share these beautiful Mehndi designs for legs with your friends and family.